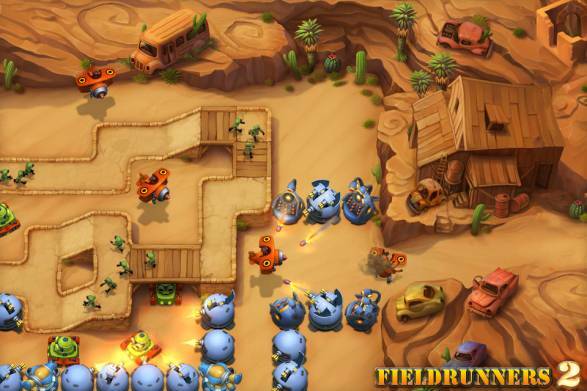 Fieldrunners was the game that started the whole tower defence genre off on iPhone, the template that nearly all the games following it copied from. 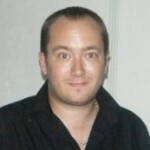 One of the first real big hits on the App Store, the game was expanded in the years following its release to such an extent that it is now nearly ten times the size it was when it first launched, although many would now be surprised to learn just how threadbare the game originally was. 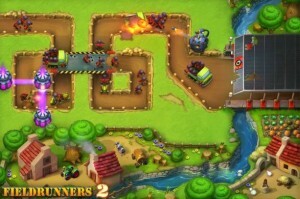 So, fans have been eagerly awaiting this sequel for some time, but Subatomic Studios would not be rushed, and rightly so, as what has resulted from their painstaking development process is what can only be described as a classic tower defence game, better than the original and perhaps better than anything that has launched in the intervening years. The first thing that I should say about this new game is that it is incredibly beautiful. Each level was meticulously hand painted, and designed down to the last detail, with a look that is approaching Pixar quality. This stunning attention to detail has resulted in levels that not only look incredible, but also play perfectly, with a true feeling of balance that is rarely seen outside of Nintendo games. 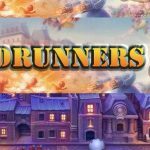 The units look as good as the levels do, and are gorgeously animated with superb lighting effects. It really is one of the very best looking games on iPhone, a fact that is even more impressive considering that this is ‘just’ a tower defence game. 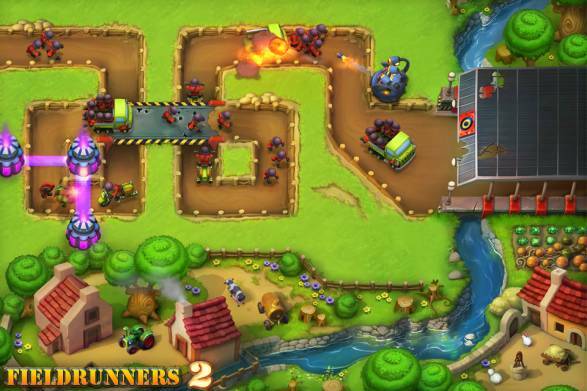 The ebb and flow of Fieldrunners 2 is actually pretty similar to the first, but on a much larger scale, with some levels having a scary amount of enemy soldiers running for your base. The behaviour of the soldiers is also worth a mention, as they seem to be intelligent enough to try and avoid trouble spots while also probing your weaknesses. It is great watching them gather together and attack strategically, even if it means this makes the game a lot tougher(different difficulty modes help to even this out a bit). Watching groups of soldiers get barged out of the way by a tank, which then creates a bottleneck, really adds a sense of newness to the game. 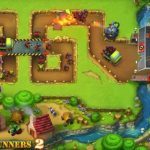 There are 25 maps to plow your way through, with new map types, such as the hybrid, puzzle and sudden death maps, adding to the variety. One important thing I should point out is that there are no in-app purchases in this game at all. You get everything in the game for your initial purchase, which is a brilliant thing indeed. Yes, there are items that can be bought and upgraded, but all with cash earned in game and fairly. It is a completely refreshing take on the genre. Seeing hundreds of little soldiers scampering over hills and under tunnel complexes to avoid your cannons, while lumbering vehicles chug along the map, gives the whole battlefield a free-form kind of play just not available in any other game. Yes, it is still possible to funnel attackers into a corridor of death, but now the little guys will actively try to spread out and avoid this, and they also seem to learn where their friends have been getting pulverised and try to find another route. 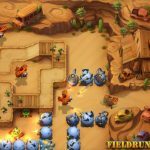 The stunning visuals are just the icing on the cake for an outstanding tower defence game that feels like a real step forward for the genre. 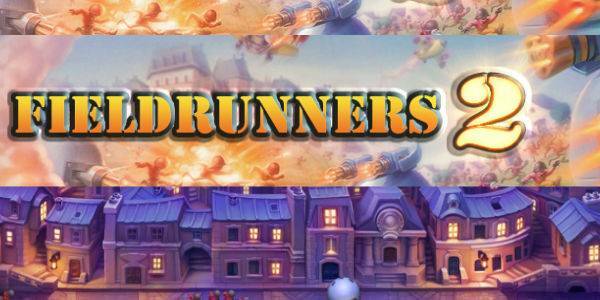 Fieldrunners 2 is never anything short of magnificent. Check out our reviews of The Great Big War Game, Pocket Planes and Super Ox Wars!